As a parent, you always want what’s best for your child and you want to do everything you possibly can to take care of them, making sure your little one is comfortable, safe, and secure. That’s why when you first become a parent and have an infant in the house, it’s important to always monitor your child’s activity, especially when he or she is sleeping. To do that, you need to get a baby monitor that you can trust like the DXR-8 Video Baby Monitor. Designed and manufactured by Infant Optics base in San Francisco, it’s a monitor that is one of the first on the market to utilize lenses that are interchangeable. Read on to learn more about it. As a top model of Infant Optics baby monitors, this baby monitor has a variety of features, starting with the interchangeable optical lens capability that it features. This is probably what makes this monitor so attractive due to the fact that it allows you to specifically set it up for your monitoring needs. For example, if you’re concerned about your infant’s sleeping habits, you can use the optical zoom lens to get a close-up view of what your baby is doing. Or, if you have a large area, like a longer, wider play area, then you could use the wide angle lens (which unfortunately is sold separately from the base model) to get a view of the entire room since it offers a 170-degree panoramic view. Plus, these lenses are easy to change as they can be removed and mounted in a matter of seconds. Has a 5″ Color LCD Screen with night vision, a temperature indicator, and a sound activated LED with a display unit with remote control capability of the mounted camera itself, offering pan an tilt direction of the camera. Long battery with a reliable charge. When in power-saving mode, the battery can be used for 10 hours or six hours if the display screen is continuously running. Has dual USB charger and an additional power cord. Comes equipped with 4GHz FHSS Communication with Data Encryption and Talk-Back. This offers very clear communication that is also reliable. The monitor has linking capabilities, allowing you to link up to four cameras to just one display unit. As with all products on the market, there are both positives and negatives associated with this baby monitor selection. Being able to keep tabs of your children without having to constantly go to their rooms. Ease of use thanks to its large display screen. Long battery life allows for constant monitory while dual USB chargers and power cord let you take charge of how you charge the monitor. Multiple lens options let you personalize how you view your child. The optical zoom lens is available at an extra charge. Sound can sometimes be hard to hear. Initial set-up can be cumbersome if you’re new to using this type of monitoring equipment. If you’re considering purchasing the Infant Optics DXR-8 video baby monitor, here are some tips to follow when purchasing one. To begin with, make sure that you do your research when buying this, or any monitor for that matter because you really want to make sure that it’s the right one for you. You can do this by going online and seeing what information you can find in relation to specifications, reviews, and opinions. A second tip to following when buying a baby monitor relates to getting it for the best possible price. If you really want to save money on what you’re buying, don’t just buy it the first place that you find it. Instead, do some price comparison shopping on different websites to get the best deal. With that, there are all sorts of sites that offer free shipping and other discounts, allowing some of the higher end baby monitors to be more affordable. In most cases, we suggest Amazon.com as the most trusted and one of the most affordable places to buy a baby monitor online. And, a final tip to following when getting a video baby monitor is to follow your instincts when it comes to what you purchase. For instance, if your gut is telling you to go with one monitor over another one even if the price is higher, do it because, in the end, you want to be confident in your decision and not second guess yourself by downgrading just to save a few bucks. What really sells the Infant Optics DXR-8 video monitor as a quality buy are the multiple parent testimonials that support it. From checking into different online forums and websites, the majority of the parents tend to like this monitor and all the features that it comes with. Some found it to be rather pricey though, however, were still willing to pay that price because of everything that it offered. 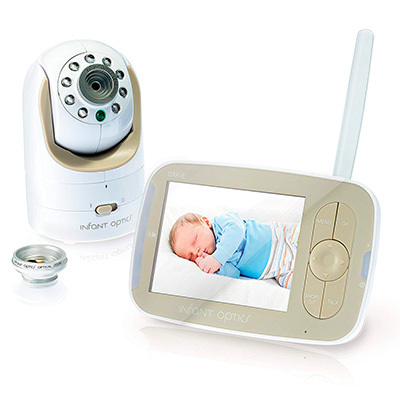 Ultimately, if you’re looking for a convenient way to monitor your little one’s every move, then rely on the Infant Optics DXR-8 Video Baby Monitor. With its optical zoom lens that lets you really hone in onto what your child is doing, excellent battery life, and durability, it would be tough to find a better option. So don’t delay and go online to get yours today with a discount. You’ll be glad that you did when you have peace of mind knowing that your child is all nice and tucked in his or her bed, safe and secure. Also, you may consider another cheaper model of Infant Optics baby monitors – DXR-5.